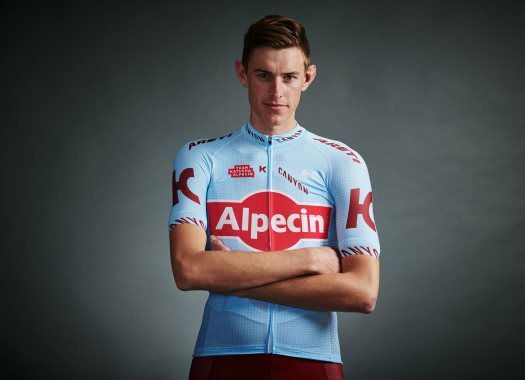 Katusha-Alpecin's Nils Politt has finished in the second position of Paris-Roubaix. The German rider couldn't equal Philippe Gilbert's final sprint and crossed the finish line just behind the Belgian. Politt was part of the front group after the Trouee d'Arenberg and launched a strong attack in the last kilometres of the race that only Gilbert could follow. The duo arrived together to the Velodrome of Roubaix and Gilbert launched a strong final sprint that was impossible to beat for the German. "I was never disappointed today," said the rider. "It’s my fourth year and to get 2nd in Paris-Roubaix, losing against Philippe Gilbert, who won the World Championships and so many races, it’s not a shame. I wanted to start the sprint from the back but Philippe played his card with Yves Lampaert coming from the back. He started before me but in the end, I think Gilbert had the best punch for the sprint. Although Politt stepped onto the final podium with tears in his eyes, he still holds the race close to his heart and hopes for a better outcome in the future. "I did it as a U23 and crashed five times but still after that, I told my father this was a race for me," the German commented. "Roubaix means a lot to me, I really like this race. My improvements show it’s a good race for me and I’m really looking forward to next year. I thought Gilbert would attack me before the end. I figured my only chance to win would be in the sprint. It didn’t happen that way."